Hello everyone, Flaviu here! 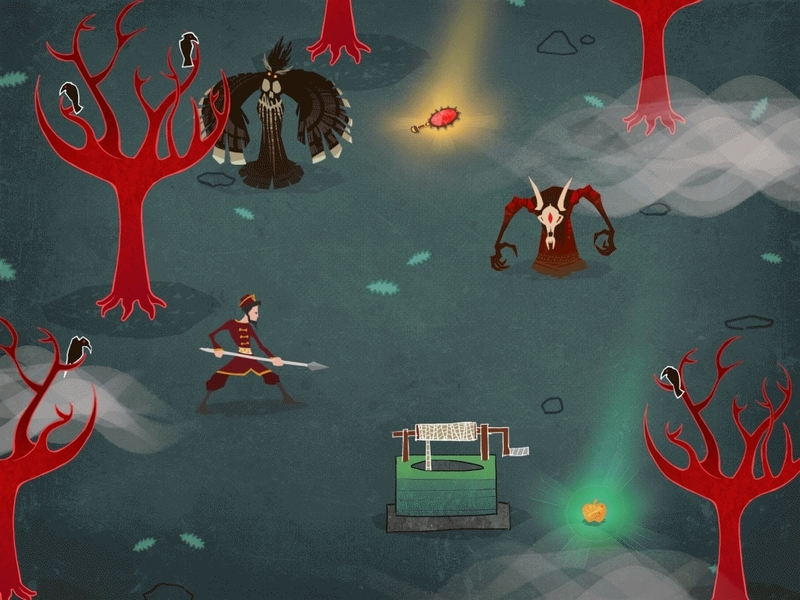 I wanted to spend a few minutes to talk about how we came up with the art style for Yaga. For every game I’ve worked on, the beginning has proven to be an extremely fun but challenging task, because you start off with a blank canvas (still scary to this day), some very broad limitations and your own imagination. But seeing everything come together step by step is very rewarding. And the limitations amount to having clear guidelines, which saves a lot of time and headaches along the way. The process we used was simple: me and Andi would try out a bunch of things, then the whole team would get together and discuss. We’d talk about our choices, get feedback and then go back to draw some more. I wanted a more stylized approach, while Andi wanted something with a bit more polish and detail. This made the whole thing a bit difficult at times, but was a blessing in the long run as we would each come up with very different ideas and kept pushing each other’s vision. Like most other things in an artist’s work, defining an art style starts with looking over a ton of reference, analysing shapes, colour, rhythms and a dozen other things. We spent days researching Slavic folklore and trying to define a “Slavic look”. We also studied the works of other artists – off the top of my head, worth mentioning are a few classic artists of Slavic descent such as Ivan Bilibin and Viktor Vasnetsov, who illustrated some of our childhood fairy tale books. On the more abstract side, of great influence was Sukharev and the art of Secret of Kells (especially the backgrounds). And although there were many many others, I’m not planning on creating a whole list here. At least not now. Time for the pretty pictures! After having a few conversations, each artist was encouraged to go his own way, but stylize everything a bit more. Looking back, I’m a bit surprised by the lack of folkloric elements in those pictures. This is probably the point where the two directions started to slowly come together, even though we didn’t know it yet. Andi made the following image, which I then tried to integrate into my own. To my surprise they fit quite well. Looking back, my idea of reversing the traditional style and giving contours to the background, not to the characters, was not really working. Andi kept opposing this idea and now I see why: the background gains way too much focus and this muddles the whole image. From this point on, we kept merging the two art styles together as we went on. We took the volume and play of shapes from Andi’s work, and the textures and paint splashes from mine. We completely dropped the contours, turned down saturation and added some colour grading. Ivan’s character took shape, then the first version of the forest environment, and the artistic vision became clearer with every step of the way. Even after months of work there are still things that need to be made clearer and early art that needs to be replaced, but overall we’ve learned a lot and found the best solution for the game. I liek the final artstyle, and I love Bilibin´s Artwork. I can´t really see Vasnetsov´s influence in the final artstyle, though. Would be absolutely perfect for things like cutscenes where somone tells an old tale. Or illustrations for in-game books and stuff.